You are currently browsing the archives for 31 January 2010. 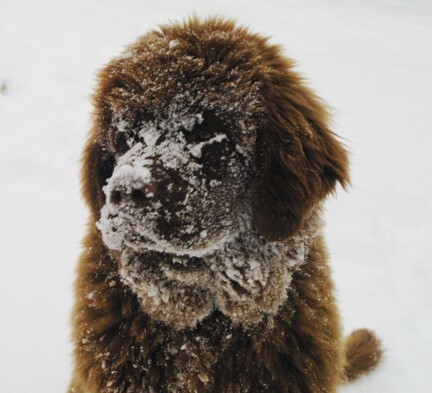 Little Newfie RuShou at age 5-1/2 months, is thoroughly enjoying his very first snow. Anytime any of the others goes outside, he’s right on their heels…. or pushing them aside to get out the door first. For some odd reason he keeps burying his face in the snow, he may be eating mouthfuls of it. He is definitely funny and he LOVES the snow. Today he weighed 88 pounds and he’s almost as tall as any of the others. No he’s not fat or gaining weight too quickly, he’s just going to be a ‘big boy’. 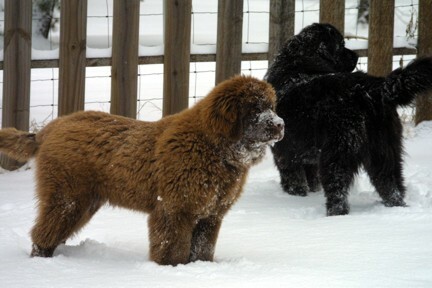 His mom, grandmom and grandad are all large newfs. He also has huge paws. 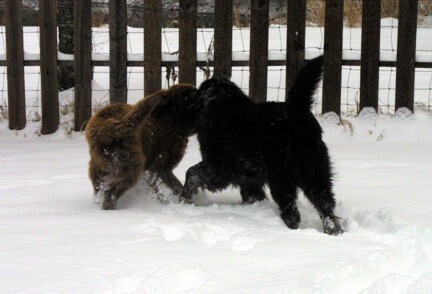 He and Bucca love playing together and Bucca is so wonderful with him. Often he will flip onto his back and let RuShou pounce all over him with just an occasional pawswipe to keep the pup happy. So RuShou is growing up so fast. We’re beginning to see the signs of him about to lose his ‘puppycoat’ fur. Although he will be about 2 or 3 years old before his actual ‘brains’ get here and he is grown. He’s just such a sweetheart though and we can’t than Bill & Pat enough for trusting us with this guy.